This watch is part of the brand new Pilot Classic Series, featuring watches designed with a nod towards the very first Fortis pilots watches. 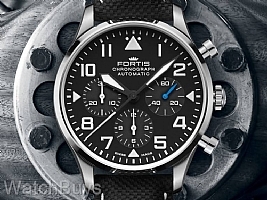 To create this new chronograph, members of the Fortis design team studied many photographs of the very first pilots watches made by the brand. The Pilot Classic Chronograph starts with a matte black dial with white hands, numerals, and accents - all coated with Superluminova. Sub-dials can be found at 3, 6, and 9. The 41 mm case size is an ideal fit for most wrist sizes, and the styling of this watch makes it suitable for casual to formal dress. We love the case on this watch - it is finished with both polished and brushed elements. 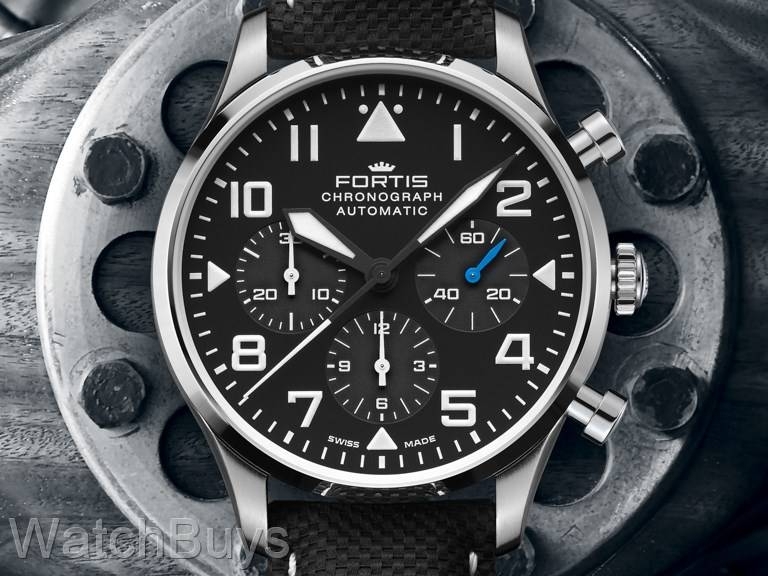 The Fortis Aviatis Pilot Classic Chronograph is sleek for a watch with full chronograph functions. The luminous triangle at 12, a staple of Fortis watches regardless of style, is right at home on this model. The block-style, retro numerals stand out against the black dial and work well with the sword hands found on the watch. The sweep seconds sub-dial at 3 features a blued sweeping seconds hand. This blue hand is a new styling element found on all new watches in the Fortis Pilot Classic models.